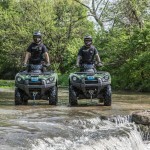 Off road or on, the KCPD North Patrol Division is ensuring the safety of Kansas Citians. 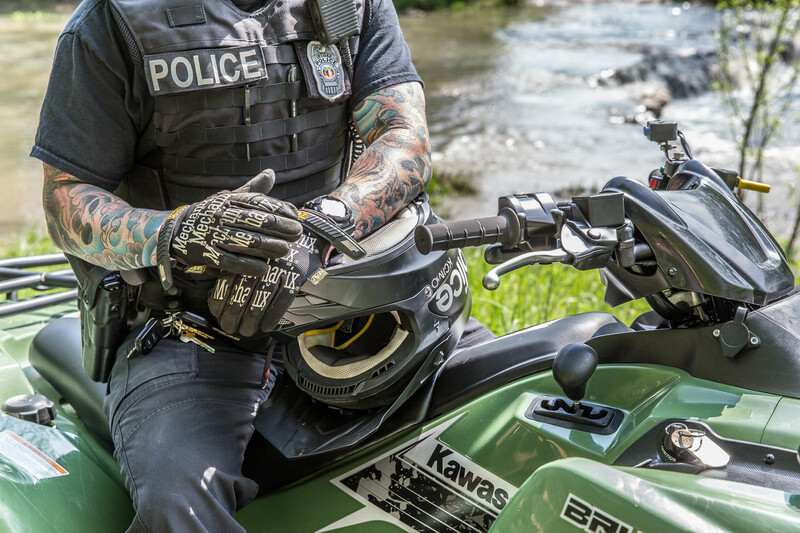 When most people see a vest or car marked ‘Police,’ they are less than thrilled. After all, once the boys in blue show up, something bad has certainly happened, right? 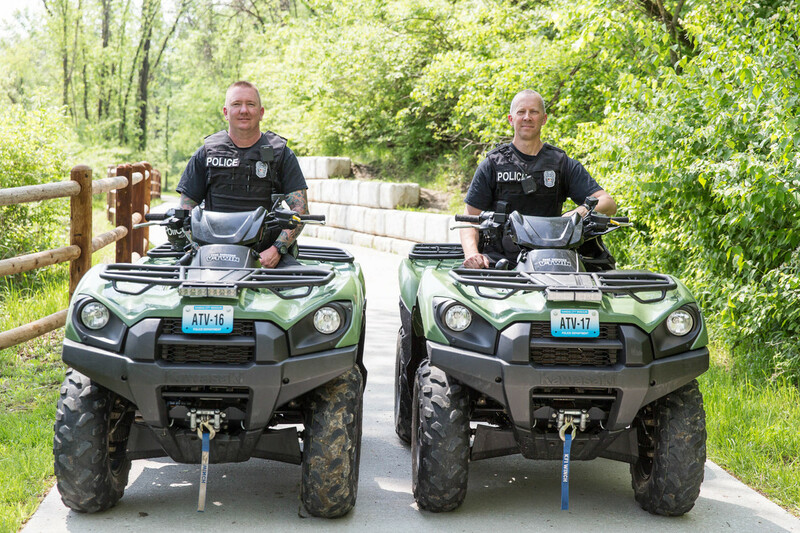 The KCPD North Patrol is trying to change that perception, and one way they are doing it is with the ATV unit. 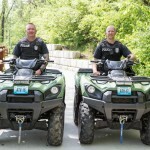 The unit, comprised of Police Officers Aaron Hiebert and Rocky Rhodes, is tasked with patrolling the areas where a Crown Victoria or a Dodge Charger just simply can’t maneuver. 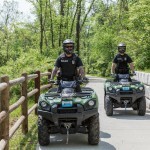 Commonly these areas include the biking and running trails and rural or farm properties, as well at special events such as the Royals’ World Series Games or the Kansas City St. Patrick’s Day Parade. 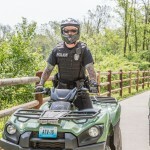 The squad began in 2001 because of a need, according to Police Officer Paul Burkhalter, community interaction officer for the North Patrol Division. Several farmers in the area began noticing illegal dumping, trespassing and poaching on their land. 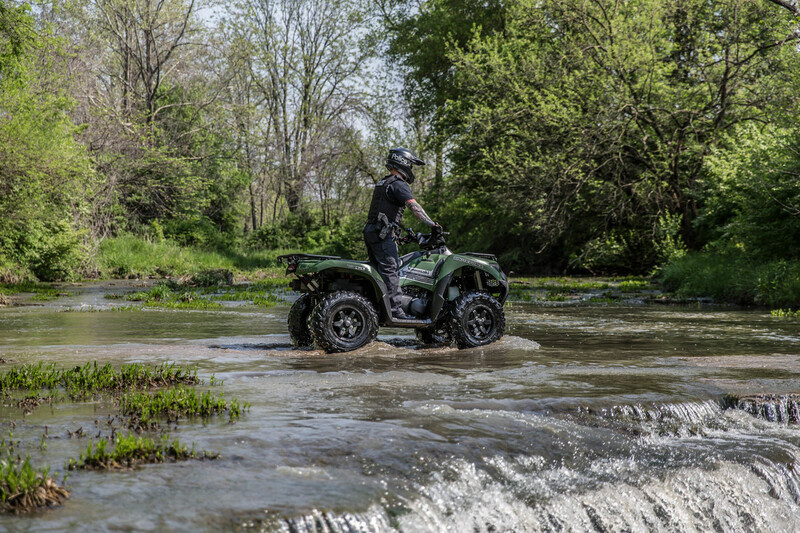 With few roads on the larger tracts of land, all-terrain vehicles were deemed necessary. 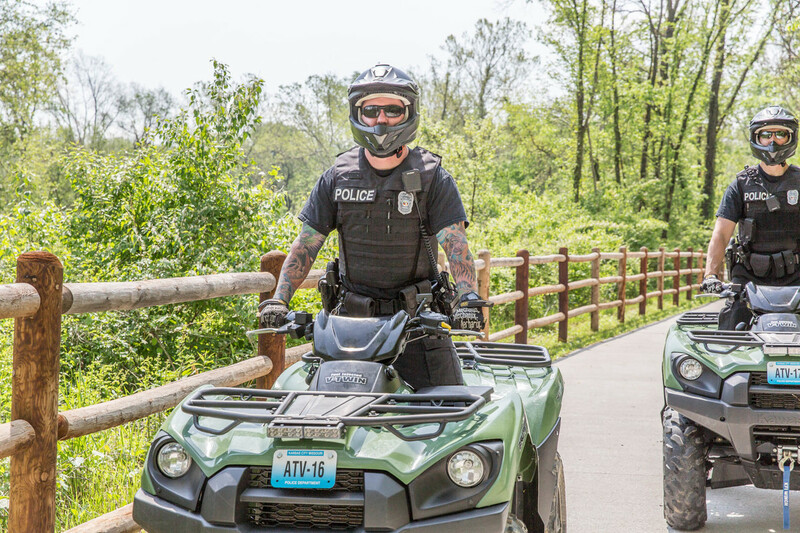 By adding patrol duties of the 28 parks north of the river (totaling 1701 acres), the assignment has become a full-time commitment. 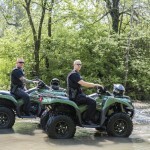 The officers assigned to the ATV unit must pass a 50-hour POST certified course taught by Certified KCPD Instructors. Burkhalter says that since its inception the unit has been very well received. 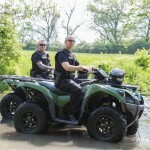 “The ATV’s have proven time and time again to be a very useful tool to our police department,” says Burkhalter. 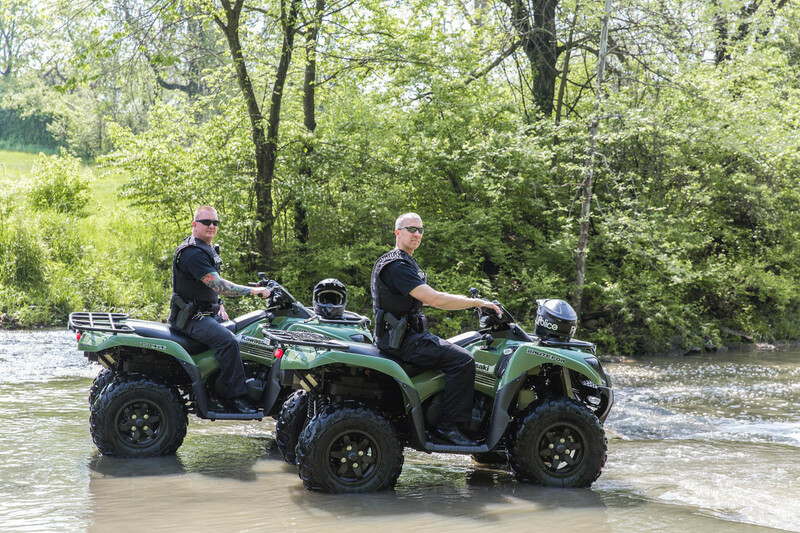 For Officers Hiebert and Rhodes, the assignment offers a very positive working environment. They say that the interaction they have with the public in this capacity is generally much more positive than other situations. 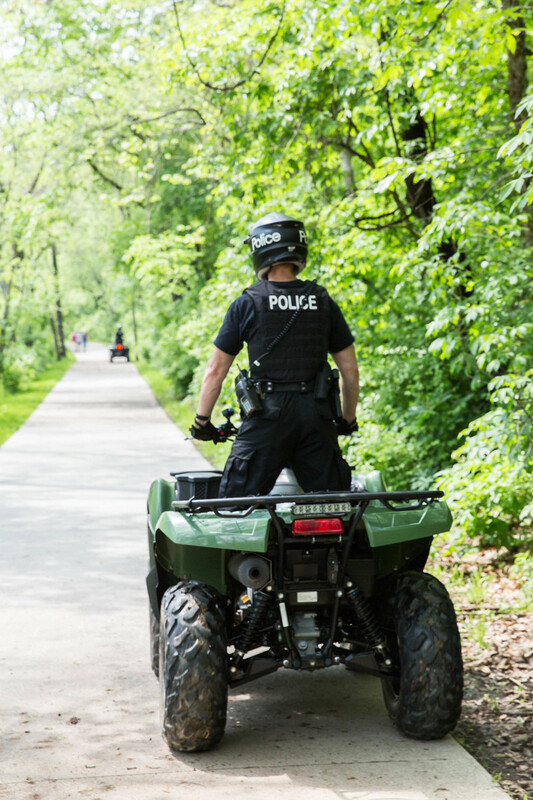 On a recent sunny morning, Northland Lifestyle went on patrol with the squad at Line Creek Trail. 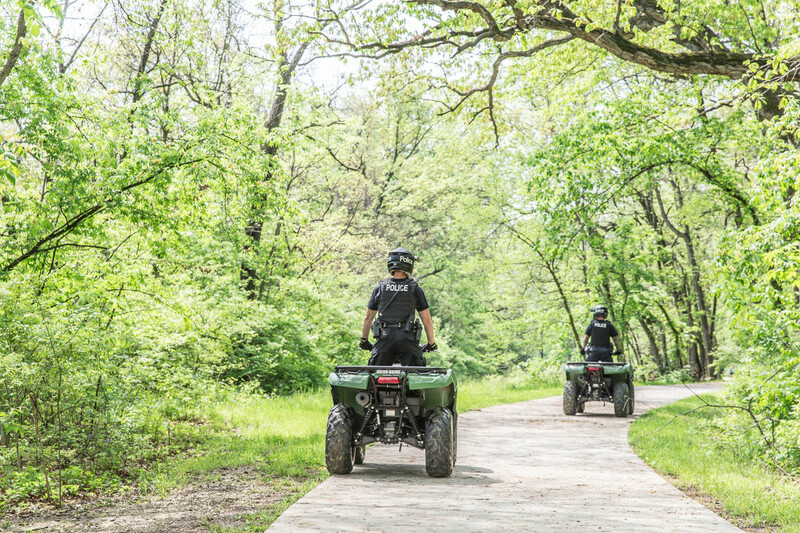 Patrolling the trails is one of the more visible assignments and many of the walkers or bikers stopped to see if there was a problem. Rhodes says that this is often the case but patrons shouldn’t worry if they see the unit. They are here to prevent problems first. “Most of it at this point is proactive," says Rhodes. "We haven’t had a ton of problems just yet but as the sun goes down there are activities that can happen. 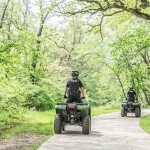 And of course if there’s an issue of a medical nature where someone has been out in the parks and gotten hurt, if you’re familiar with the area then you can get to them faster to get them to medical help." Hiebert says that most of the response has been positive. The City is helping to make the officers’ job a little bit easier by adding mileage markers along the way so that if there was an emergency patrons could identify their location more easily. 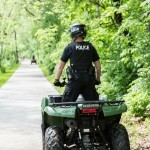 On the five miles of Line Creek Trail, knowing an exact location will be essential for speed if someone is hurt. 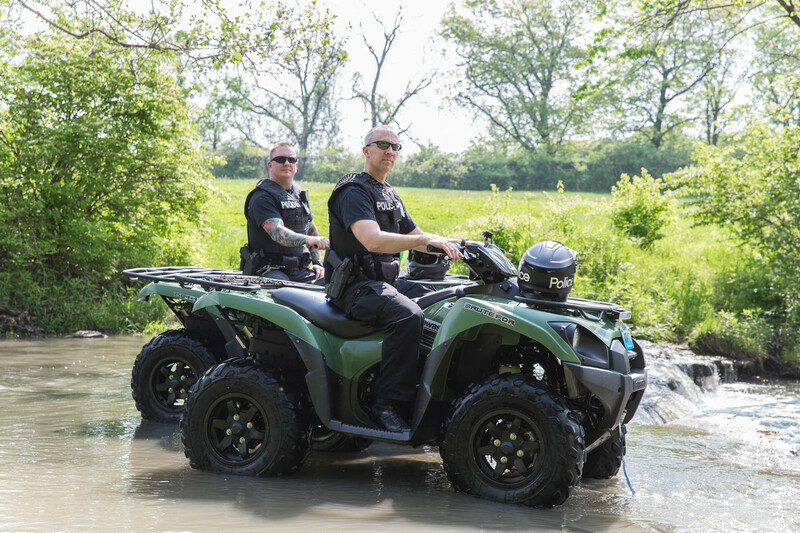 While the ATV unit was created for a very specific purpose, it has served another purpose as well: creating a sense of community and goodwill between officers and the public. 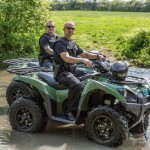 At a time when anti-police sentiments are running high, the ATV unit offers an example of the positive and proactive engagement with the community. 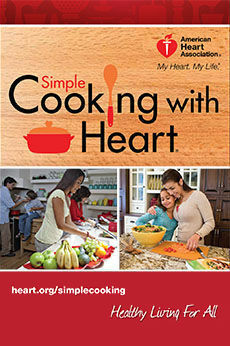 “It’s part of our job description but we also get to develop relationships with the people that we run into. A lot of people have been very thankful that we are out here,” says Hiebert. Rhodes says it's as much a community building effort as it is an active patrol. Line Creek Trail user Karen Essig agrees. 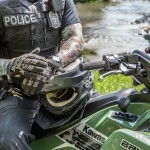 She stopped to take an Instagram picture with the officers as she was riding with a friend. “I was riding with my husband a few weeks ago and I told him, ‘I’m so glad there’s a police presence out here,’" says Essig. "It’s nice to see them out here. 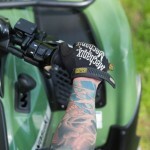 I heard about some break-ins nearby so it’s really great to see the police out and around." 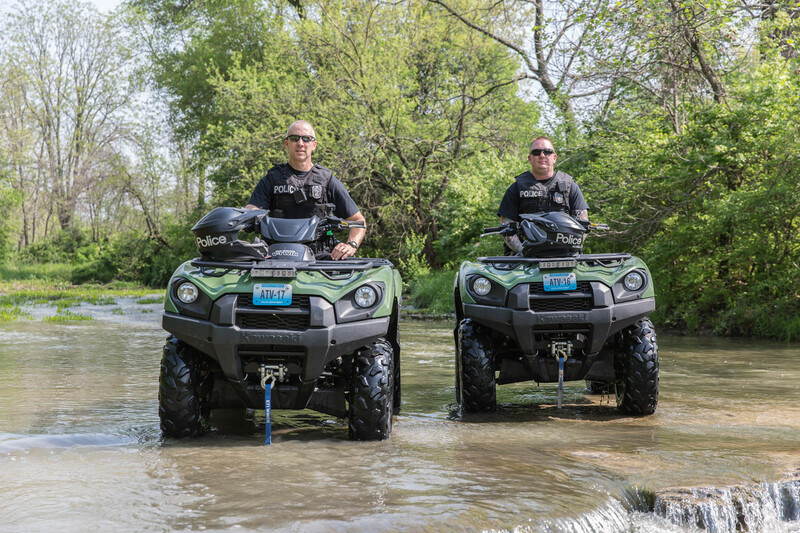 Outside of the park patrol, the officers actively work with landowners that are experiencing problems. That can include everything from illegal hunting to dumping trash to vagrant populations making camp. “We always get permission from the landowners and generally, they have already called and asked for assistance after ‘no trespassing’ signs haven’t worked," says Rhodes. "We can go out and investigate homeless or vagrant camps and deal with them. It puts the neighbors’ minds at ease. 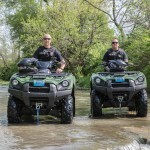 We work with Missouri Conservation as well on hunting issues." 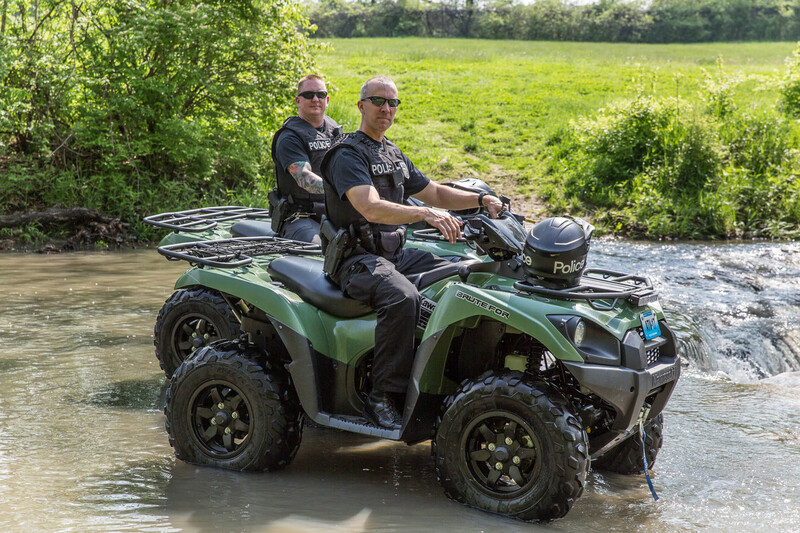 For both Hiebert and Rhodes, the ATV unit offers a working environment that they enjoy. 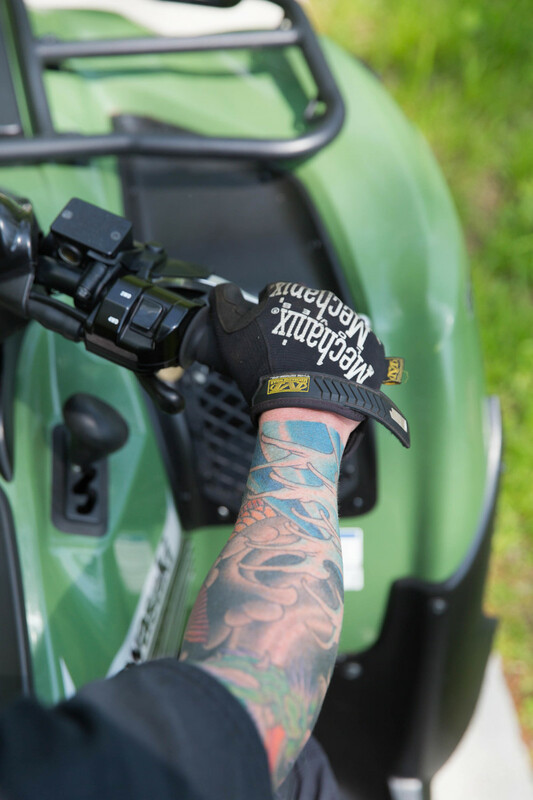 Prior to joining the ATV unit, Hiebert was a motorcycle officer. He says he’s always enjoyed working with machines. 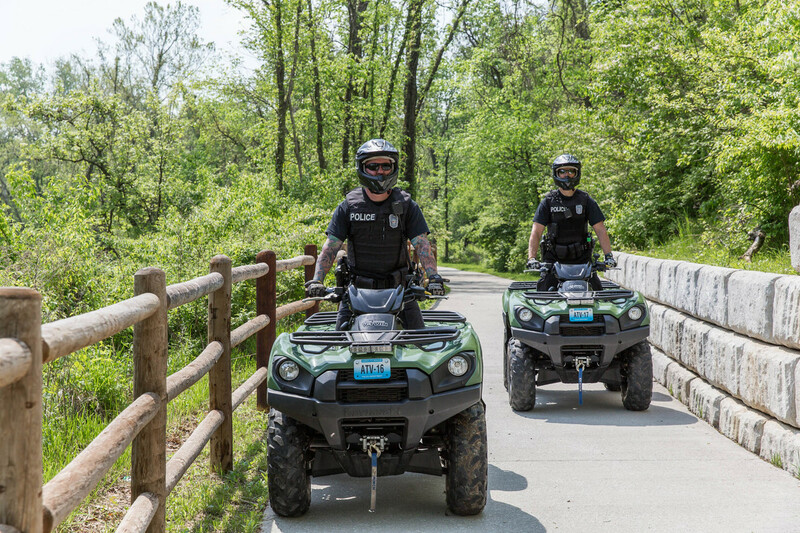 As for the police versus the people issues that have cropped up in areas like Ferguson, Missouri, and Baltimore, Maryland, both officers believe that the Kansas City Police Department has a good relationship with the community they serve. 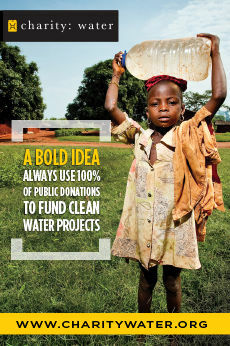 “Here in Kansas City, the public opinion has seemed pretty positive," says Rhodes. "We’ve been down to some of the protests on the Plaza and they have all been very peaceful. As far as our department is concerned, we have a pretty good relationship with the public. Of course you have extremes on both sides, but as a whole, it’s been good." Hubert says the police department is very professional. "Professionalism is pounded into your head in the Academy and we stick to that," he shares. "And as for cleaning up an area, there has to be work put in on both sides and think we’ve done a good job maintaining the relationships that help that to happen here." 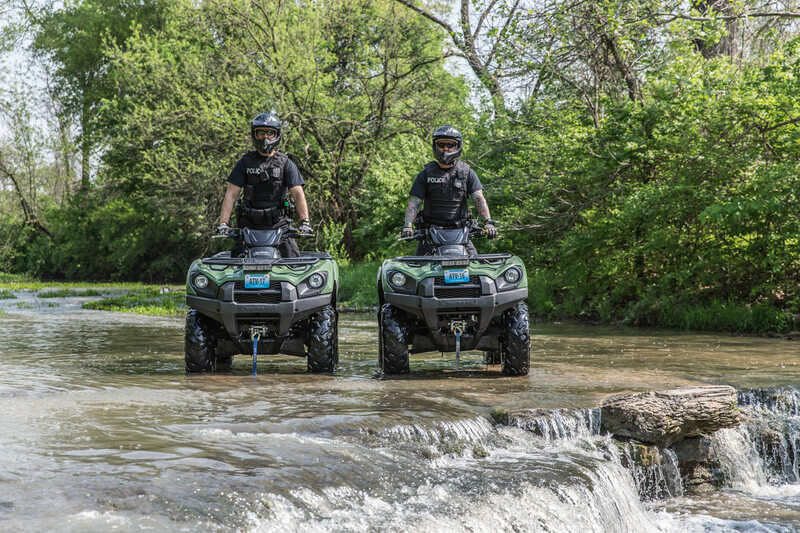 For Officers Hiebert and Rhodes, every day is a chance to change the perception of the police in the community and they are doing that on their feet, wherever they need to be.